Wow. 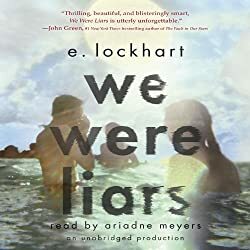 I’m going to try not to spoil anything for you because the less you really know about E. Lockhart’s We Were Liars going in, the more you are likely to enjoy it. Having said that, I know a little taste of the book is sometimes necessary for readers who might be on the fence about reading a book. Here goes. Cadence Sinclair Eastman, known as Cady, is the granddaughter of the wealthy and WASPish Harris and Tipper Sinclair, who own a private island near Martha’s Vineyard complete with a full staff, a large manor house where Harris and Tipper live, and three houses for each of Harris and Tipper’s daughters: Carrie, Bess, and Penny. Carrie is the oldest and has two sons: Johnny and Will. They live in New York City. Bess, the middle daughter, lives in Cambridge with her four children: Mirren, twins Liberty and Bonnie, and Taft. The youngest daughter, Penny, is Cady’s mother. They live in Burlington, Vermont. Each summer the family gathers to spend their vacation on the private island, known as Beechwood Island. Cady can’t remember much about the year fifteen summer due to an accident she had, and a shroud of secrecy surrounds the story. Her family does not speak to her about it. Cady is desperate to return to Beechwood Island and see her two cousins Johnny and Mirren along with Gat, nephew of the man Cady’s Aunt Carrie is living with. Gat has been visiting Beechwood Island as a guest of the Sinclairs for years, and over time, Cady has fallen in love with him. 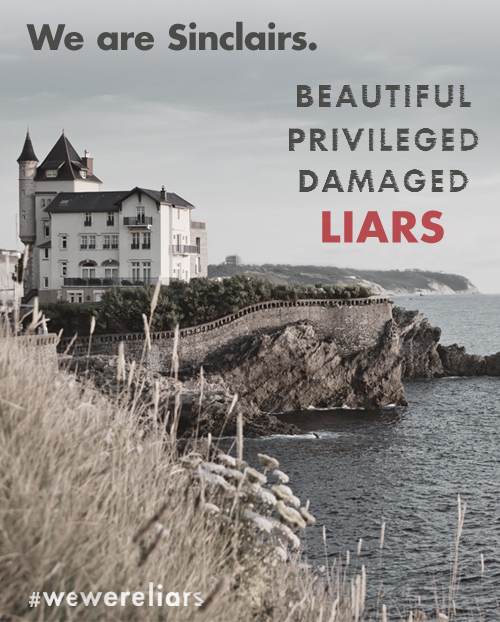 Together, they were the Liars, and they forged a close summer friendship that waned as they returned to home and school each year, but picked up right where it left off the following summer. But even the Liars are strangely silent and reluctant to talk about Cady’s accident. I anticipate that some readers will have difficulty identifying with the privileged Sinclairs and their idyllic summers on their own private island. I admit it’s a barrier, but if you take a peek at the family dynamic, it’s a great deal easier to feel empathy for the family. They have a secretive, fractured family. One of my favorite aspects of the novel was its connection to King Lear and an assortment of fairy tales. In fact, I’m wondering if this book might not be a good one to bring into my AP Literature class, which will be reading both King Lear and Jane Smiley’s modern adaptation A Thousand Acres. I could see a small literature circle group really enjoying the connections between this novel and the other texts. I understand that some readers don’t like the writer’s style. 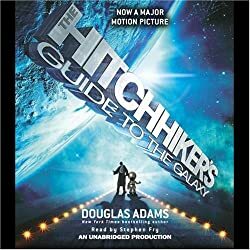 I listened to the audio book, and the narrator naturally had a great deal of influence over how the text was interpreted, so I can’t speak to those complaints except to say that if the style is bothering you, you might try listening to the book instead. I don’t think I have ever finished an audio book in one day before. I just wanted to find out what would happen. The suspense of not knowing what was going on with Cady’s family or her accident kept me up late until I finished the book some time after 1:00 A. M. Saturday night. This was a perfect start-of-summer read, even if the story is a tough one. While it is YA, I would classify it as more mature YA—for high schoolers rather than middle schoolers, but it’s definitely appropriate for students in high school, whom I would imagine would really love it. I know this is the kind of book I would have inhaled had it existed when I was in high school. Ariadne Meyers’s narration is perfect for the story. She emotes when necessary, and she pulls the cynical teenager when it’s called for. I liked her reading so much that I downloaded another book that I’ve been wanting to read that she also narrates through Audible. I’ve been listening to Graham Greene’s The End of the Affair narrated by Colin Firth as I have puttered around the house, washing dishes or making soap, for about a month now. This production was the Audiobook of the Year at the Audies in 2012. It is, in fact, a beautifully read audio book (which I will get to in a moment). The End of the Affair is the story of Maurice Bendrix, who is reflecting on an affair he had with Sarah Miles, wife of Henry Miles. During the war, Maurice’s apartment building suffers damage as a result of German bombing, and Maurice is knocked unconscious. He wakes to find Sarah looking over him, and he quickly realizes something is wrong. Sarah abruptly calls off her affair with Maurice. Thinking it must be another man, Maurice hires a private detective to follow Sarah. Rather than losing Sarah to another man, Maurice discovers he’s lost her to something much larger and more complicated than he imagined. I was surprisingly moved by this story. I think it was perhaps the unlikely friendship of Maurice and Henry, the wronged husband. I don’t want to give away plot points if you want to read the novel, but the two men form a bond, and the strangest thing about the bond is how “not weird” it is. In fact, the way Greene sets it up, it makes perfect sense in the context of the story. Despite glimpses at her personality through her diary and letters, Sarah remains more of an enigma than Maurice and Henry. Greene’s characterization of all the characters, whether major or minor, is rendered realistically. I did feel as if all the people I read about existed somewhere, and that this story might really have happened to them. The novel is also an interesting study of psychology. Greene is an astute observer of humanity. Those interested in Kübler-Ross’s theories about the acceptance of death (here applied to the end of an affair), will recognize much of Maurice and Sarah’s behavior, even though Kübler-Ross’s model of the stages of grief was not published until 1969. In particular, the book focuses a great deal on bargaining, which I found interesting. Maurice’s arc as he moves through the stages is particularly fascinating psychologically, but to say much more would spoil the plot. Colin Firth is an expert reader. Of course, you would imagine that he would be. He renders Henry Miles’s parts in a sort of Mark Gatiss tone that is perfect for the character. I think I could honestly have listened to Firth read the phone book and be mildly entertained. He gives the same breadth and nuance to this performance as he does to his acting performances. He’s an excellent narrator. 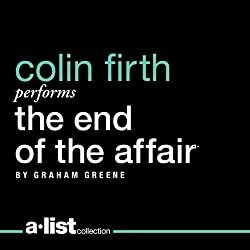 Published in 1951, The End of the Affair is my selection for a 20th Century Classic in the Back to the Classics Challenge. 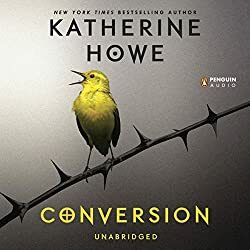 My most recent audio book was Conversion by Katherine Howe and read by Khristine Hvam. Conversion alternates between two stories. Colleen Rowley is a high school senior at St. Joan’s Academy in Danvers, Massachusetts. She’s currently in a heated competition for school valedictorian and is stressed about getting into Harvard. Her classmates suddenly develop mysterious ailments—one girl has an apparent seizure, but soon another girl is losing her hair, while others develop tics and coughing fits. What is going on? The other story is that of Ann Putnam, Jr., one of accusers in the Salem Witch Trials, and a real historical figure who later confessed to being “deluded by Satan” and apologized for her role in the deaths. As she tells the story of her involvement in the trials to Reverend Green, it becomes increasingly clear she’s still disturbed (which might not be historically accurate, but it was fun). What exactly caused the girls of Salem Village to think they were bewitched in 1692? And what was wrong with the girls at St. Joan’s 320 years later? When Colleen is given an extra credit assignment by her AP US History teacher to read Arthur Miller’s The Crucible and write a paper about why Miller changed the details connected to some of the girls—Ann Putnam in particular—she discovers an eerie connection between the events in the Witch Trials and the girls’ illnesses at St. Joan’s that no one else seems to have noticed. Katherine Howe has written about Salem before, particularly in The Physick Book of Deliverance Dane (which happens to be one of my favorite historical fiction novels). In fact, Deliverance Dane, her daughter Mercy, and her descendant Connie Goodwin all make cameo appearances in this novel (which I rather enjoyed). In this case, she was also inspired the the story of a mysterious illness that afflicted students at at high school in Le Roy, New York. The true cause of the “hysteria” in the Witch Trials has been debated, and we will likely never have an answer—just perhaps more plausible theories. In juxtaposing the events in modern-day Danvers (which used to be Salem Village) and Puritan Salem, Howe shows us it’s just possible that the girls were under a great deal of stress and that their treatment as girls and, in some cases, lower class servants, contributed to the deaths of innocent people when the witchcraft accusations began to fly. It’s certainly a plausible explanation and takes into account that perhaps the girls really were faking at first and later became caught up in a shared delusion. Conversion is a highly enjoyable book that has a lot to say about the stress teenagers are under in today’s competition for grades and college spots and also the ways in which we discount teens’ voices. I should think that teenagers would find a lot to relate to, and at the same time, they would learn some interesting things about American history and literature. The narrator, Khristine Hvam, did an excellent job not only capturing the voices of the teenaged girls, but also the old New England cadence of Ann Putnam’s speech. She was perfect for the novel, and she’s one of the better book narrators I’ve heard. I am really glad I listened to the audio book with the exception of one reason: the Author’s Note was not included in the reading, and it has some interesting information for readers. I had to track it down so I could read it. I really liked this interview at Bustle and this other review at the Nerdy Book Club. After saying last week that I usually review books in their own posts, here I go reviewing a book in this post, just like I did last week. It just so happens that I only finished one book this week, anyway, and I finished it today. First, an update on my reading challenges. I’m still keeping up with my Literary Movement Challenge. Next up in April will be the biggest test of this challenge so far because I’ve decided I want to read The Annotated Wuthering Heights for April (Romanticism). Up until now, the works I’ve read have been shorter and not quite as dense as this book, but ever since I ordered in it December, I have been looking forward to cracking it open. Can’t wait! It’s been a while since I’ve read Wuthering Heights, and and can’t wait to see what the annotated edition offers. I am doing fairly well with the other challenges, and thought it’s still early days, I feel that I might be able to complete them all this year. I may actually be able to increase my participation level in the Historical Fiction Challenge. I am trying to decide what book to listen to next, now that I’ve finished Bossypants. I’m not sure I’m ready to go back to the Diana Gabaldon books yet. I might read Shadow of Night by Deborah Harkness. I enjoyed listening to the first book in this trilogy. I keep thinking I might enjoy the other two, and I already have them in my Audible account, but I just haven’t listened to them. I’m not really close to finishing anything else, unless I really read a lot this coming week. I have lots of books in the TBR pile, and I’m looking forward to getting into them. On the other hand, I’m looking forward to a busy week, so we shall see. 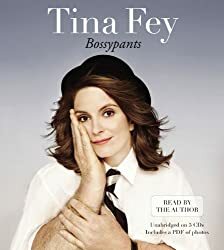 I think perhaps the best way to read Bossypants is to listen to Tina Fey’s Grammy-nominated audio version. Hearing her delivery added some spark to the book, and I’m not sure I’d have liked it as much if I had just read it. The book has some genuinely funny moments. I loved her descriptions of starting school, her high school days participating in theater, and her early improv days. Hearing her discussion of what it was like to work on SNL, to create her Sarah Palin character, and to create the show 30 Rock were all very interesting to me as well. One thread that runs through the book is that Tina Fey came up in comedy dominated by men, and her experiences of sexism in the industry were particularly though-provoking if not surprising. One thing I didn’t like is that the book didn’t seem to have a narrative arc. It was more a string of different life experiences, and I didn’t see them woven together as clearly as I might have liked. However, Fey’s delivery made me not care so much—I felt like I was having a conversation with a smart friend. 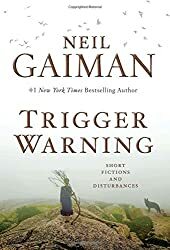 I listened to Neil Gaiman’s latest short story collection, Trigger Warning: Short Fictions and Disturbances, on Audible, mainly because I know that Gaiman is quite a fantastic reader (not all writers are). Unfortunately, that also meant that I didn’t have a real sense of the way in which the collection might hang together as a whole because I listened to it mostly in bursts as I cleaned house or made soap. As such, I can only really recall my favorite stories with any clarity, and I don’t have a print book to examine in order to refresh my memory, so I skimmed what pieces I could find in Amazon’s preview and Google Books. Finally, I found this review, which discusses each piece with a rating out five stars. I won’t discuss each story. Just the ones I liked or remembered better than the others. “The Lunar Labyrinth” is the first story in the collection (following the poem “Making a Chair”). This story made me think of American Gods, and given that I knew the collection had an American Gods story in it, I assumed it would be this one. It wasn’t. Still, the story does nod toward the American Gods concept that those silly roadside attractions are more than they seem. I liked the story “The Thing About Cassandra” quite a bit. How would you feel if you made up an imaginary girlfriend, and years later your friends and mother are insisting they ran into her? “The Truth is a Cave in the Black Mountains” reminded me of straight up fantasy. It’s a little bit Tolkienesque, but doesn’t quite make it. “Orange” story told completely as answers to questions the reader doesn’t hear. Humorous and a little scary at the same time. “The Case of Death and Honey” is a Sherlock Holmes story about Holmes’s quest to solve the ancient question of how to live forever. I quite enjoyed this one as both a story and a contribution to the Sherlock Holmes repository. “The Man Who Forgot Ray Bradbury” is a poignant comment on loss of memory as well as a love letter to one of Gaiman’s favorite authors. “Nothing O’Clock” is a Doctor Who story. As I listened to this one, I kept wishing it had been filmed. It would have made an excellent episode. It’s set during the time of the Eleventh Doctor (Matt Smith) and his companion Amy Pond. The Doctor and Amy land on Earth in the TARDIS to discover that no one exists, and a voice insists they’re trespassing. “Black Dog,” as it turns out, is the American Gods story, and I didn’t like it. As with American Gods, I could see that Neil Gaiman was doing something interesting with the idea of ancient gods in modern times, but in the end, I just wasn’t into it. The other stories and poems didn’t leave enough of an impression on me to merit discussion here. I thought the collection as a whole was a bit uneven, despite moments that I absolutely enjoyed. The individual stories I mentioned in this review are worth seeking out (with the exception, in my opinion, of the last. As much as I did enjoy Gaiman’s reading, I don’t think I’ll listen to another short story collection on Audible. I can’t recall enough of the individual stories, and there is not an easy way for me to glance back at the book again. I was tempted to give this only three stars, but the truth is, when the stories are good, they are really good. As I make soap, I’ve been listening to audio books, and I just finished a really long one—Drums of Autumn, the fourth book in Diana Gabaldon’s Outlander series. Like the other books in this series, Drums of Autumn is narrated by Davina Porter. This book picks up the story of Jamie and Claire as they settle in North Carolina on Fraser’s Ridge. Their daughter, Brianna, who lives about 200 years in the future in the late 1960’s, discovers disturbing news about her parents and decides to go through the stones at Craigh na Dun and help Jamie and Claire. Roger Wakefield, sometimes known by his birth name of Roger MacKenzie, discovers what Brianna has done and follows her through the stones. I have read this book once before. I will just lay this on the table: I am not a fan of Brianna’s. I don’t like her personality much, and I can’t put my finger on why. Claire, to me, is interesting because she’s so knowledgeable about medicine, and I found her understanding of herbal healing particularly fascinating. I’m not into herbalism per se, but as a soap maker, I do find it interesting. Claire is no-nonsense, passionate, intelligent, and above everything else, interesting. These [hard nuts] are the most difficult characters for me to animate; the characters whose function in the story is structural—they’re important not because of personality or action, but because of the role they play. Perhaps it’s just my opinion, and others might disagree, but I would argue that Gabaldon doesn’t succeed fully in making either Brianna or Roger as real or as interesting as Jamie and Claire, or even as real and interesting as other minor characters who pop off the page. Davina Porter is a heck of a good narrator, especially deft with handling all the voices of the characters. I would definitely seek out other books she has narrated just to hear her read. In case you are wondering at this point, I have been enjoying the new Outlander series on Starz quite a bit. It is very true to the book, and the casting is excellent. I haven’t missed an episode yet. Even my husband is watching with me, insisting, “I don’t get how this is considered a woman’s story. I mean, I guess the books are romances…” Not exactly. Sort of difficult to classify. At any rate, the series is beautifully shot with great music and some fine acting. Check it out, if you haven’t. Re-Reading Harry Potter: "Never Laugh at Live Dragons"
The penultimate book in C. S. Lewis’s Chronicles of Narnia is The Silver Chair. This book features the Pevensie siblings’ cousin Eustace Scrubb, who first appeared in The Voyage of the Dawn Treader, and Jill Pole, a classmate of Eustace’s at a boarding school called Experiment House. Eustace and Jill are being chased by bullies when they are magically whisked to Narnia and become embroiled in a quest to find the missing Prince Rilian, the son of King Caspian X, who is now an old man. *Sigh*. Where to start with this hot mess. I didn’t like it from the start because it’s quite clear that Lewis is attempting to skewer progressive education in his characterization of Experiment House, but rather than create a good satire, he winds up sounding like an old fart who doesn’t know what he’s talking about (“Back in my day, we took switches to kids and prayed in school!”). Eustace and Jill are not nearly as likable as the Pevensies. Puddleglum is fun, but then I think I liked him mainly because of Jeremy Northam’s voice characterization—he had the best West Country accent. The male superiority is maddening. Jill actually says, “Where I come from, they don’t think much of men who are bossed about by their wives.” Um… What? I can’t imagine Lucy Pevensie saying such a thing. Yes, I know all about Susan being interested in lipstick and stockings in the next book. Which I will read to say I’ve read the whole series. It’s clear Lewis was thinking of Sir Gawain and the Green Knight by having the Lady of the Green Kirtle kidnap and enchant Prince Rilian, but the stories diverge quite a bit aside from a passing similarity, which is a bit of a pity, because the rest of the plot is unremarkable. For a children’s book, the pace bogs down rather unforgivably once the characters go underground, and the plot is predictable from the start to the finish. Jeremy Northam’s narration, however, is superb. I just wish he had better material to work with. One thing I figured out after reading this book—I would love to visit Hogwarts and Middle Earth, but I have zero desire to go to Narnia. I finished listening to C. S. Lewis’s Prince Caspian over the weekend, and I haven’t had a chance to do my review yet. Prince Caspian takes place one Earth year after the Pevensie siblings—Peter, Susan, Edmund, and Lucy—have returned from Narnia through the wardrobe. They are at the train station preparing to go off to school, when they are suddenly whisked back to Narnia. It takes them some time to realize where they are because everything has changed. While they have been gone, hundreds of years have passed in Narnia, and they discover they have been summoned because Narnia once again has great need of their services. Prince Caspian, rightful king of Narnia, has had his power usurped by his evil Uncle Miraz, and he can’t defeat his uncle alone. Each of the novels in this audio book series is narrated by a different great British actor. I found Kenneth Branagh’s reading of The Magician’s Nephew utterly charming, while Michael York’s reading of The Lion, the Witch and the Wardrobe a bit spottier. Alex Jennings’s read of The Horse and His Boy was also good. Lynn Redgrave’s reading of Prince Caspian is excellent. She did a masterful job capturing the characters’ voices and using different types of accents. She managed to inject the patronizing tone of older siblings into Peter and Susan, and her characterization of the dwarfs Trumpkin and Nikabrik made me glad whenever they took the “stage.” I also particularly enjoyed her characterization of Doctor Cornelius, Reepicheep, and Trufflehunter. It looks like she has narrated a few other audio books, so I have to recommend her highly. What a shame she is no longer with us. Of the four Chronicles of Narnia books I’ve read or re-read this year, I would say Prince Caspian comes in a strong second after The Lion, the Witch and the Wardrobe. The Pevensies strike me as similar to King Arthur: they will come when Narnia has great need of them, and the device of Susan’s horn to call them was clever (and somewhat evocative of other myths). I really loved some of the minor characters in this one. Caspian is likeable, but Trumpkin, Reepicheep, Trufflehunter, and Doctor Cornelius are loveable. I like the idea that Narnian time passes at a different rate. I wonder if I can say this, though, without making someone angry: I just don’t like Aslan. He’s not bad, he’s just so heavy-handed a symbol. I realize it would wreck Lewis’s Jesus allegory if he removed Aslan from the stories, but I would find them more interesting if they had to figure out how to defeat the enemies without him as a deus ex machina. I also don’t find his personality particularly compelling. I understand his role in the stories, but he just doesn’t interest me as much as the children do. I suppose that if he is supposed to represent Jesus, then I’m not really sure I like this particular characterization of Jesus. 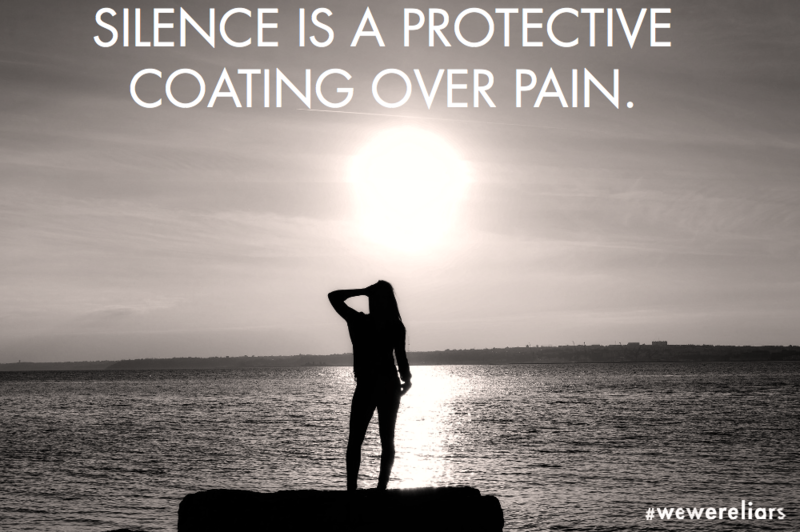 Jesus struck me as less judgey and more gentle. I know he overturned the moneychangers’ tables at the Temple, but I mean on the whole. Aslan is forgiving, too; I’m doing a sloppy job putting my finger on their differences. Suffice it to say that I don’t find him as much fun as the other characters. In all, this was a very enjoyable reading. I know I’m liking an audio book when I find excuses to wash the dishes so I can listen to a book while I do it. I mean, that’s just crazy, right?